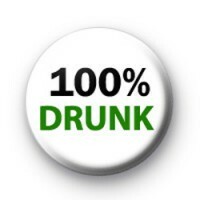 100% Drunk Badge. If you like your late nights coupled with lots of alcohol then this is the perfect badge for you. Let everyone know you are very very Drunk. Vicki, thanks received the badges on Wednesday. Totally fab! Super badges & they arrived quickly. Loved the packaging too. My kids are over the moon with them. thanks koolbadges.